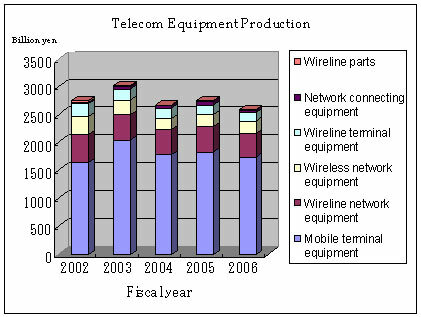 The CIAJ has released their annual Telecommunication Equipment Production and Trade Figures report covering fiscal 2006. The total value of production was pegged posting 2.589 billion yen, down 5.7%, slipping back to negative growth for the fiscal year. Growth categories include wireless network equipment at 212.7 million yen, up 1.2% over the previous year, of which fixed telecommunication devices accounted for 125.6 million yen an increase of 5.6% YoY. Wireline parts posted 19.1 billion yen which reflects a positive growth of 8.5% compared to fiscal 2005. The total figure for imports in FY2006 was 473.8 billion yen, up 21.8%, recording the third consecutive robust annual growth over the previous year. Wireless communication equipment 234.3 billion yen gained 108.8% over 2005 of which cellular phones accounted for 154.6 billion yen reflecting a positive growth of 149.4% over the previous year. – Mobile terminal equipment 1.735 trillion yen down 5%, of which cellular phones accounted for 1.633 trillion yen or negative growth of 4.7% over the previous year. – Public-use PHS 37.5 billion yen a loss of 12.7% over the previous year. – Wireline network equipment 430.3 billion yen was off 6% of which switching systems accounted for 168.4 billion yen (or -12.6% over the previous year and transmission equipment accounted for 261.9 billion yen a 1.3% reduction over 2005. – Cellular phones showed negative growth despite the launch of one-segment broadcasting and mobile number portability. – Negative figures for public-use PHS reflected a back-lash from the steep growth the previous year. – In transmission equipment, the switch to fiber optics and IP pushed the figures for digital transmission equipment up to positive growth, but other categories were unable to sustain the growth from the previous year, reverting to a negative growth for the entire category. – The market itself for wireline terminal equipment shrank, pulling down the equipment figures down as well, but intercoms accounted for 53.7 billion yen — up 6.6% over the previous year — showing healthy growth.